The Toddler Program environment is intentionally designed to meet the needs of children between the ages of 12 months and three years. This class provides an environment where children experience living in a community and participating in real life activities that support age appropriate development. Exercises in the Toddler Program fall into four general categories: practical life, language, manipulation, art and music. This area is the most important part of the classroom as most toddlers begin to show interest in accomplishing things on their own. Each activity is purposefully chosen to encourage that desire of independence and build confidence. Practical Life activities for toddlers follow simple guidelines. The young child enjoys the challenges of activities, such as table washing, mirror polishing, dish washing, food prepartion, dressing, feeding, and toileting. Toddlers are enthusiastic to learn the names of things around them. They want to know the words that are fitting for their social interactions. As they are determined to communicate with others, they increase their vocabulary through songs, books, picture cards, and conversations. In our Montessori Toddler environment we provide a lot of language materials such as books, objects and pictures for naming, but most importantly our teachers talk and listen to the child. Toddlers are gaining coordination of their hands, they enjoy finemotor tasks, such as puzzles, stringing beads and rings, matching, and sorting. Toddlers also love sensorial exploration of water, sand, dirt, clay, textured objects, the smell of flowers and food, discriminating size, color, and sound. In this area children are introduced to an array of materials and activities to enhance their discoveries. 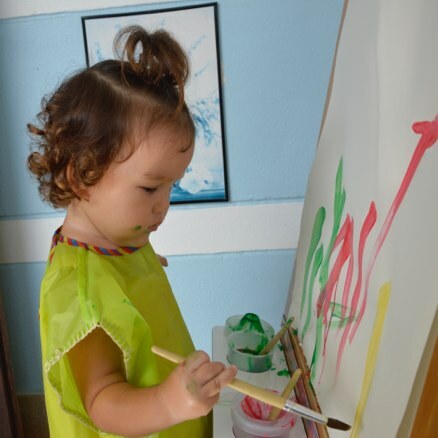 Toddlers enjoy basic creative work such as cutting paper, gluing, coloring with chalk or crayons, and painting with watercolors at the easel. It's very interesting for them to use new materials so we expose them to a variety of art mediums. Music is used many ways throughout the day. Since toddlers are learning language, they are interested in words as well as melody. We sing as a group, with just one or two, with instruments, or just with our voices. Some sing along; some still only listen. Toddlers are learning to control their movements, so they enjoy simple finger plays and motions to music. songs even signal transitions in the schedule.